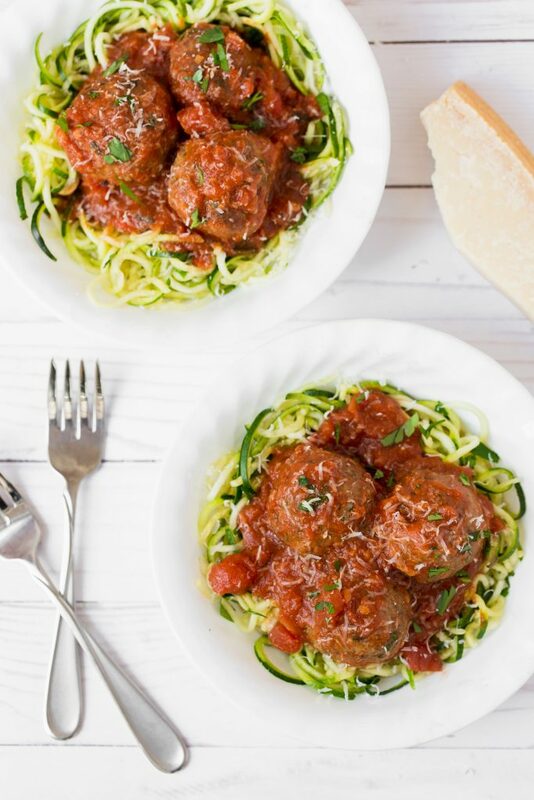 Mozzarella Stuffed Turkey Meatballs over Zoodles – A lighter, baked meatball made with zero bread crumbs, stuffed with ooey, gooey cheese, served in marinara sauce atop zucchini noodles. Spaghetti and meatballs are comfort food at its finest…but traditional dishes are heavy that don’t always leave me feeling my best. Here, I’ve created a lighter baked meatball made with ground turkey, lots of garlic and herbs for lots of flavor, and ground flax in place of bread crumbs to hold it all together. 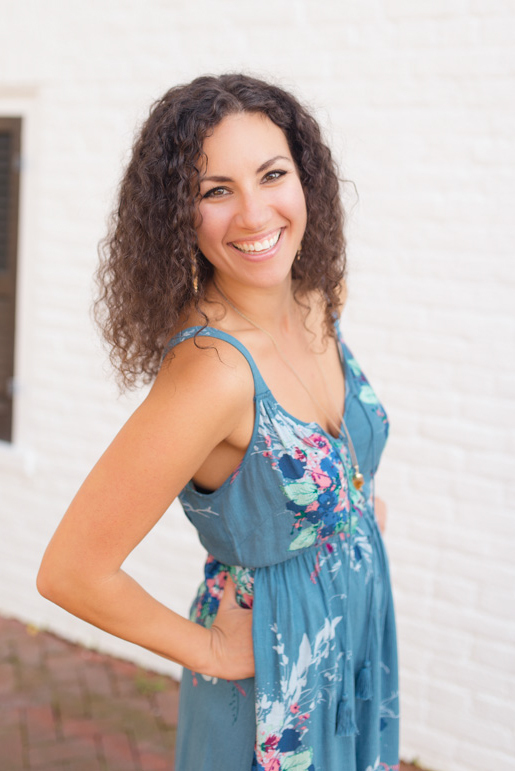 Using chia seeds or flax in meatball & meatloaf recipes that typically use bread crumbs for a binder is a great way to reduce your intake of refined carbohydrates and increase your fiber (keeps ya full and promotes a healthy gut) and omega-3 intake (anti-inflammatory and heart healthy)! For fun, I added a cube of mozzarella cheese in the middle of each meatball prior to baking. Because, really, what’s more fun than melty mozzarella? 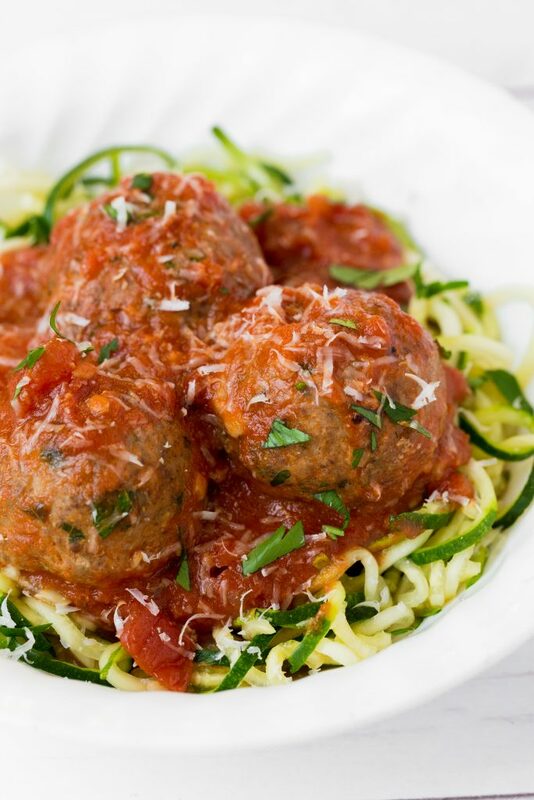 I served these meatballs over raw zoodles to keep this a lighter and gluten-free meal. Plus, my love for zoodles isn’t stopping any time soon. You can also lightly saute the zoodles in a bit of olive oil before topping with sauce and meatballs – but just for a few minutes (like, less than 5) otherwise they start to turn mushy and watery. Feel free to substitute whatever pasta you like best or are in the mood for! Preheat oven to 350 degrees. Coat baking sheet with cooking spray. Combine turkey, egg, garlic, herbs, salt, pepper, and flax in mixing bowl and combine until evenly mixed. With wet hands, shape mixture into 2-inch meatballs. You should get about 12 meatballs. Lightly flatten and make an indentation in each meatball. Place a piece of mozzarella in each meatball and reshape the meat mixture into a round shape, taking care to completely cover the cheese. Place meatballs on baking sheet. Bake meatballs 15-20 minutes, or until golden on bottoms. 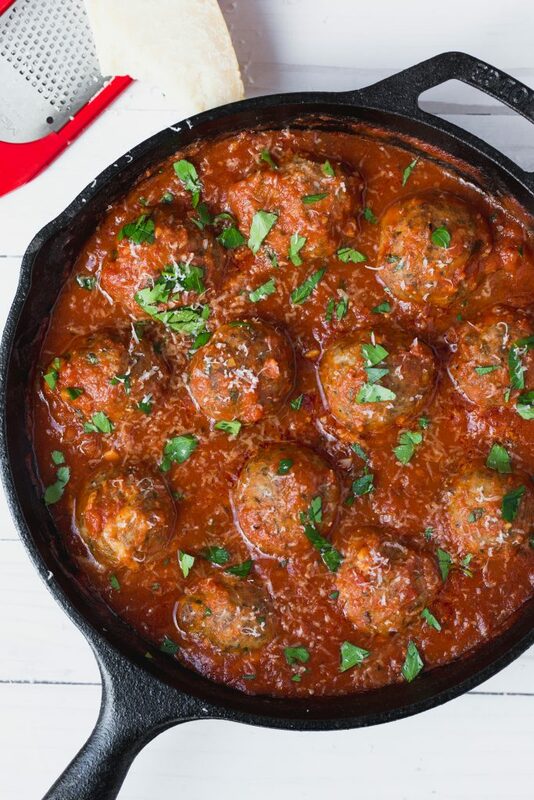 While meatballs bake, pour marinara sauce into a skillet set over medium heat. Bring to a simmer, then reduce heat to medium-low. Transfer meatballs to simmering marinara sauce. Let cook additional 15 minutes. Serve meatballs and sauce over prepared zoodles or your choice of cooked pasta. I made this for dinner tonight. Sadly the ground flax took over the flavor of the meatballs. I think I will try this basic idea again but use a different proportion of spices and use almond flour instead of the flax. Hi Elizabeth! Sorry to hear you didn’t prefer the flax in the meatballs. If you make it again subbing almond flour, I’d love to hear about the results!! Thanks for reading!